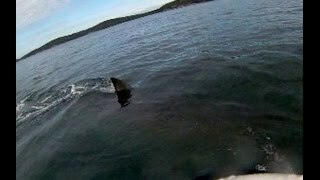 A kayaker in Western Australia had a close encounter with what was believed to be a great white shark on July 28. The shark, judged to be between four and five meters long, pushed the back of the kayak then came up from the side and proceeded to push in sideways. This GoPro footage video shows the moment when Ian Watkins noticed the shark while kayaking in King George Sound near Albany.